Mega Blaziken, one of the first Mega Evolutions to be revealed for Pokémon X and Y, will shortly join the S.H. Figuarts range. Scheduled for an October release across Japan, with pricing unknown, the posable figure is one of the latest additions to Bandai Namco Group’s globally popular toy range. 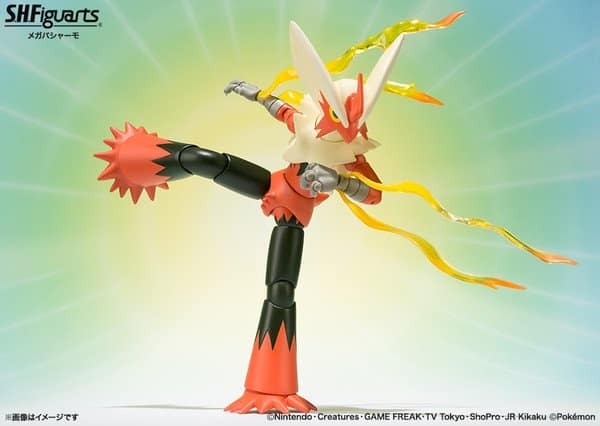 Mega Blaziken will hopefully prove a notable addition to the range, which on average stand at 14cm (approximately 5.5 inches) tall, evolving from Torchic, which will appear as as starter Pokémon in Pokémon Omega Ruby and Pokémon Alpha Sapphire later this year. Pokémon Omega Ruby & Alpha Sapphire will release in North America on November 21st, and Europe on November 28th.